Over the years academics in the field of legal translation such as Marta Chroma and Coen Van Laer have been highly vocal about the need for good quality legal dictionaries to assist legal translators in their task. Of course, legal dictionaries can’t provide all the answers but are still an essential tool. I’ve written extensively about the quality of Greek-English legal dictionaries in the past, indicating that the quality of these essential tools for getting legal translations done is affected by a great many factors. Sadly, existing dictionaries out there tend to score very poorly when judged by their fitness for purpose. Most are mere word lists and lack the sort of information that legal translators need to navigate the difficult seas from source to target language, culture and legal system. That is especially true for the Greek-English language combination. Academic articles are regularly published on legal lexicography but a relatively new, comprehensive book on the subject is a welcome addition. Prof. Łucja Biel, University of Warsaw, recently published a review of Legal Lexicography. A Comparative Perspective. Law, Language and Communication which was published in 2014 by Ashgate Press and edited by Máirtín Mac Aodha. She said, “Definitely, it is a must-read for legal translation and legal language researchers”. With that in mind, I’ve ordered a copy. Until the book arrives, let’s take a quick look at Prof. Biel’s review and see what her overview can tell us about state of play. Firstly, legal lexicography is a complicated field with many aspects, encompassing terminology and translation. It also covers both mono- and bi-lingual dictionaries, as well as printed and online versions of these language resources. It’s a field where technology is important and thankfully technology is starting to play an ever increasing role. Two chapters of the book (by Sandrini and Nielsen) look at the importance of shifting towards digital solutions and how this could improve the quality of legal dictionaries. Prof. Biel concurs, arguing that, “Digital technology makes it possible to better structure masses of data and to retrieve information adapted to user needs (communicative and cognitive functions) as regards its content and quantity”. In my older review of GR-EN legal dictionaries, the dictionary which was also available in electronic format also scored highest. Secondly, the way in which a legal dictionary is prepared, decisions about the sort of dictionary it will be, and questions of the intended audience (lawyers? judges? translators? the public?) all affect the quality of the final dictionary and determine how the dictionary should be judged and its fitness for purpose. 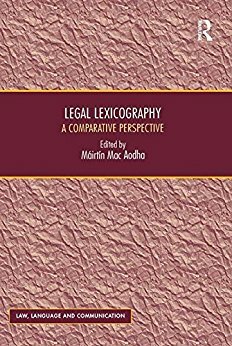 To sum up, the book appears to offer an extensive overview of the field of legal lexicography, and its importance in legal translation. It will certainly make for interesting reading when it arrives.